Pen-y-Mynydd lies in the community of Llandyrnog in the county of Denbighshire. It is located at Ordnance Survey national grid reference SJ1413266425. The mine is recorded in the CPAT Historic Environment Record as number 18163 and this number should be quoted in all correspondence. Ludlow Rocks of the Silurian period. Disused levels remain on the western slopes of Moel Arthur at SJ14106645, being the 19th century trials for gold. A single shaft is located at SJ14076635. Large area of mining activity including levels and spoil heaps and one distinctive shaft at SJ1407266353 (prn 66186). 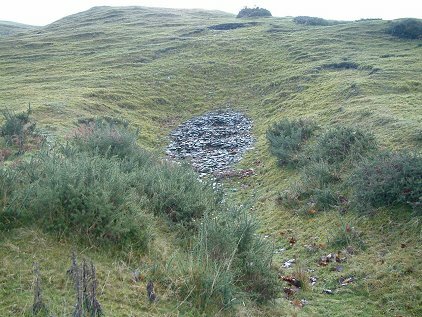 Some of the earthworks are covered in bracken so further interpretation is difficult (CPAT Tir Gofal assessment, 2003).